But things definitely don't have to be that way. Here's how to make mashed potatoes really, really well every time, without the stress and uncertainty. Psst: Don't forget the gravy, stuffing, and cranberry sauce. Follow all the tips below, but first things first: starting with Yukon Gold or a similar good-quality gold-fleshed potato is half the battle. With so few ingredients, it's a good idea to seek out the best ones you can find. Here's what we like to use. 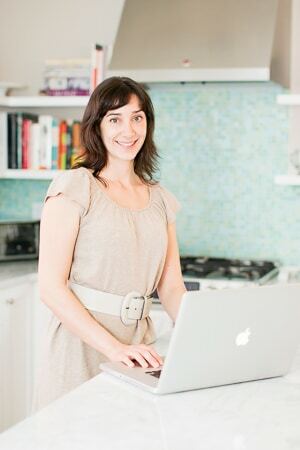 Yukon Gold potatoes or a similar gold-fleshed potato variety are basically nonnegotiable. They're so cooperative that they take the stress out of the process. Yukon Golds have just the right ratio of creaminess to waxiness to starch to yield unfussy mashed potatoes that everyone will love. At the risk of getting a little crazy on you here, if you have a water filter, use filtered water to make your mashed potatoes. For consistency of both taste and tenderness, it removes some of the randomness from your water supply. If this isn't an easy option, don't worry about it — but just sayin. Really for every purpose, and especially in mashed potatoes, it's worth seeking out a really delicious butter. So much of the industrial butter in. the U.S. is white and bland. We love Kerrygold salted butter, which comes from grass-fed cows and is cultured, both of which contribute so much deliciousness that you'll never go back. Plus, it doesn't come with a high price tag. As for nondairy milks, while we love them dearly for everyday use, mashed potatoes aren't really the place for them taste- or texture-wise. 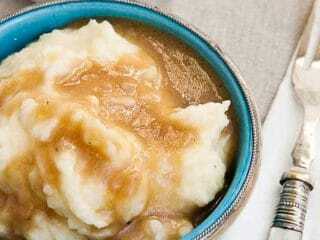 If you want or need a rockin nondairy mashed potatoes recipe, try our wasabi olive oil mashed potatoes. Fine sea salt and good old freshly ground black pepper will yield the perfect mashed potatoes everyone's expecting. White pepper is invisible but has a very different taste from black pepper, so it's up to you whether to use it. We don't. You don't need a lot of equipment to make mashed potatoes, but the right tools really help you get consistently good results. Ten pounds of potatoes is a lot, my friend. We use our favorite Dutch oven — a 9-quart Le Creuset. I won't lie: it's extremely expensive and equally heavy, and the potatoes just barely fit. For boiling a bunch of potatoes, the heaviness of the pot doesn't matter much, but the cast iron does help to keep mashed potatoes warm while you finish up preparing dinner. If you have a very large stock pot, that's a good choice, too. 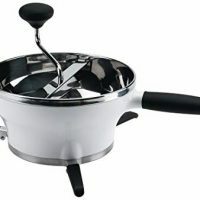 If you don't have a pot this big, you can make the potatoes in two separate pots, dividing everything in half as you go. And if you don't actually need an army's worth of potatoes, this recipe also halves beautifully. We own a good old food mill due to our homemade applesauce habit. 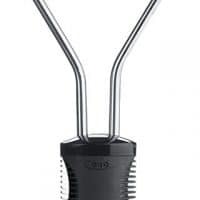 This is a great tool for magically turning potato chunks into dreamy little potato wisps without making them gluey at all. Sometimes we use our food mill, and sometimes we just go at it with our trusty potato masher. You'll get great results either way. Both tools are simple and rustic and don't overcomplicate the method or overactivate the starchiness of the potatoes. We don't own a ricer, but if you do, same goes for that tool. It's a great choice. Here are our best tips for making great mashed potatoes. They're all easy to do and just require a little attention. You'll hear all sorts of strong opinions about what size to cut your potatoes before boiling, if you cut them at all. We work with smaller chunks so they cook evenly and quickly and become infused with delicious salted water. It doesn't waterlog the potatoes unless you way overcook them. The end. Starting the cooking process with cold water ensures the potatoes cook evenly all the way through. Use the full two tablespoons of salt (true fact: sometimes we use even more). It infuses the potatoes with flavor from the inside out. When ready to drain, potatoes should take the tines of a fork easily and without resistance, but don't boil them longer than that. Start testing them early and drain as soon as they reach this point. At this stage, extra water is not your friend. Drain potatoes well in a big colander, shaking off any excess water, and return potatoes to the hot pot for a couple of minutes to dry them out a bit more. Mashing the potatoes on their own with one of these simple tools, before adding fat and liquid, gets them lump-free without complicating matters. You might have heard that you need to stir in the butter first, but we don't find this makes a bit of difference. Why add an extra step? It does pay to pour and stir in the buttery milk a bit at a time, to give the potatoes a chance to absorb them. Taste for seasoning, and don't be afraid to generously salt and pepper mashed potatoes. Think about what else you're serving and make sure the potatoes are seasoned as plentifully as the rest of the meal. The potatoes' starch will relax a bit as mashed potatoes sit, and this is a perfectly good thing. If you've used a heavy pot, you can pop a lid on it and expect the potatoes to stay hot for quite a while as you finish up other tasks. If not, you can easily reheat mashed potatoes in the microwave. We love our good old CorningWare lidded casserole for this purpose, but really any microwave-safe serving bowl will do. This recipe makes a whole lot of mashed potatoes, which to us is a dream come true. They hold and reheat very well, so you can send your guests home with some and have leftovers throughout the week. (The recipe also halves easily if you'd rather make a more demure quantity.) Follow all the tips in this post, and you'll have consistently excellent mashed potatoes without the traditional accompanying stress. Fill a very large pot halfway with cold water and two tablespoons of fine sea salt. Place potato pieces into the pot as you peel and chop them. Bring to a boil over high heat, then reduce heat and and simmer until tender, about 10 minutes. Drain potatoes in a colander. Heat the butter and milk together in a small pot over medium-low heat until butter is melted. Either press the potatoes through a ricer or food mill back into the pot, or return them to the pot straightaway and use a masher to mash them until smooth. Pour in hot buttery milk in a slow stream, stirring to incorporate. Taste and adjust for salt and pepper. 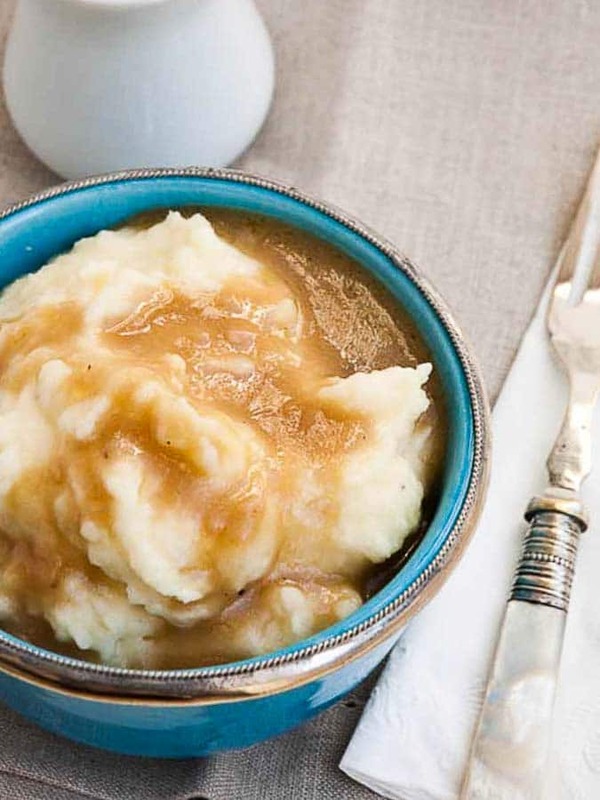 Protip: If your mashed potato leftovers outpace your gravy leftovers, make our vegetarian gravy to go with the rest. Believe it or not, you'll be in the company of thousands of people doing just that in the days after Thanksgiving and Christmas.